SUDBURY, Ont. 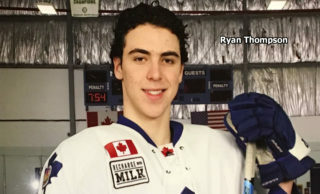 – Ryan Valentini scored at 2:19 of overtime to lift the Sudbury Wolves to a 3-2 victory over the North Bay Battalion in an Ontario Hockey League game Friday night. Seconds after the Battalion’s Cam Dineen backhanded the puck high while alone in front of Sudbury goaltender Zack Bowman, Valentini rang the puck off the crossbar into the net to give the Wolves a second straight win halfway through a four-game home stand. Valentini has scored in each of the last three games, while Dmitry Sokolov and Brady Pataki also connected for Sudbury before a crowd of 3,209. Bowman made 49 saves as the Wolves moved their won-lost-extended record to 10-26-4 for 24 points, fifth in the Central Division. Brett McKenzie and Dineen scored for North Bay, while goaltender Jake Smith faced 45 shots. The Battalion is 20-14-4 for 44 points, tied with the Mississauga Steelheads for third place in the division and holding three games in hand. 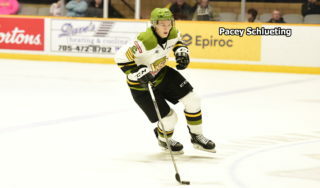 The Troops again dressed 19, one below the limit, but Zach Poirier and Brett Hargrave returned to action after serving two-game suspensions for fights in a 12-2 road loss to the Barrie Colts last Saturday night. The teams split two earlier meetings at Sudbury, the Wolves winning 3-1 on Oct. 16 and the Battalion 5-2 on Nov. 13. They play five more times, including four games at North Bay. Defenceman Dineen tied it 2-2 at 1:28 of the third period when his shot from deep on the left wing got under Bowman and sneaked across the goal line at his right post. Mike Amadio and Daniil Vertiy assisted. Sokolov struck first, at 1:25 of the second period, as he took Mikkel Aagaard’s breakaway pass from blue line to blue line and raced in on Smith to beat him with a snap shot from between the circles. McKenzie replied at 8:48, stickhandling out of the right-wing corner to the edge of the circle and wristing the puck behind Bowman. Assists went to Steve Harland, who has one in each of the last four games, and Jacob Ball. Pataki put Sudbury back in front at 13:53 when he redirected Cole Mayo’s right-point blast high into the net from deep in the right circle. Referee Seth Ferguson consulted the video goal judge as to whether the stick was high, but the goal stood. The Battalion stormed out of the gate in the first period, in which it ran up a 24-8 edge in shots, with Bowman making his fourth save, against Kyle Potts on the doorstep, at 1:35. 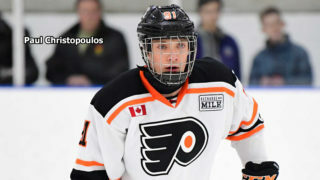 Smith foiled Matt Schmalz with the right pad when he drove across the goalmouth and stopped a following drive as Schmalz circled with the retrieved rubber in the 11th minute. Smith stopped Michael Pezzetta, open on the left side, in the 14th minute, and Sokolov shoveled the puck wide left with Smith down and helpless in the 16th. The Battalion hosts the Ottawa 67’s at 2 p.m. Sunday. BATTALION BULLETS: In 233 games, Amadio has 65 goals and 117 assists for 182 points, tied with Jay McClement for eighth place on the franchise’s career list … McKenzie has a four-game points streak during which he has three goals and one assist for four points … The Battalion went 0-for-1 on the power play. 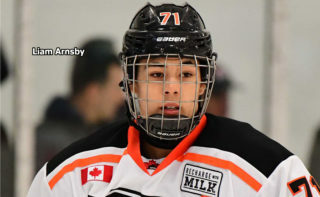 Sudbury was 0-for-2 … Opening lines featured Amadio centring left winger Vertiy and right winger Mathew Santos, McKenzie centring left winger Ball and right winger Harland and Poirier pivoting left winger David Sherman and right winger Hargrave. 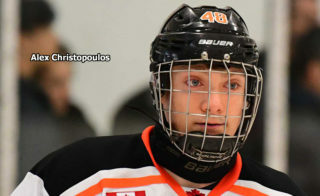 Potts centred left winger Max Kislinger and right winger Justin Brazeau … North Bay was without Zach Shankar, who has an ankle injury, Mike Baird and Riley Bruce. 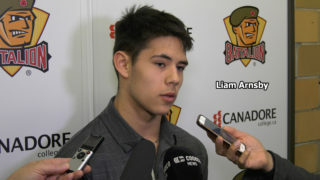 Baird finished a three-game suspension for a spear at Barrie, while Bruce served the fourth game of a 10-game suspension … Santos saw the end of a four-game points streak in which he had four goals and four assists for eight points … The Troops rallied for a 3-2 home-ice win Thursday night over the league-leading Erie Otters. Sudbury, which hosts the Otters on Sunday, won 2-0 at Erie on Dec. 18 … General manager Barclay Branch confirmed last Sunday that Matthew Menna, 17, had been sent home, leaving Bowman and Troy Timpano, both 18, as the Wolves’ goaltenders.